There are some days when only a BIG slice of buttery homemade Yellow Cake will do. Preferably, slathered in a generous coat of rich chocolate buttercream, but I’m not picky! If you’ve been searching for the perfect scratch Yellow Cake recipe, look no further. Today we’re excited to share a perfectly fluffy, moist and flavor-packed scratch Yellow Cake recipe with you. Just look at this beautiful Yellow Cake!! Ahhhhh…. Everyone needs a go-to homemade Yellow Cake recipe, and this one deserves a place in your recipe file of favorites. It’s our go-to. This recipe is not only delicious, but it’s so versatile! This moist scratch yellow cake recipe also works perfectly for yellow cupcakes! The cake layers are very moist and soft, but sturdy enough for fondant, and it makes a great base cake recipe for adding extracts and flavorings. When we created our popular homemade Marble Cake recipe, we just had to base it on this satisfying yellow cake recipe. So on days when you need a little extra chocolate with your yellow cake, don’t miss our delicious Marble Cake recipe (pictured towards the bottom of this post). Yellow cake layers are often used in Coconut Cakes as well! This is the yellow cake recipe that we use for our coconut cakes, (plus a little coconut extract.) Heavenly! Now let’s talk about frosting. I can’t think of a frosting that doesn’t taste fantastic with yellow cake, but chocolate buttercream is my personal favorite. 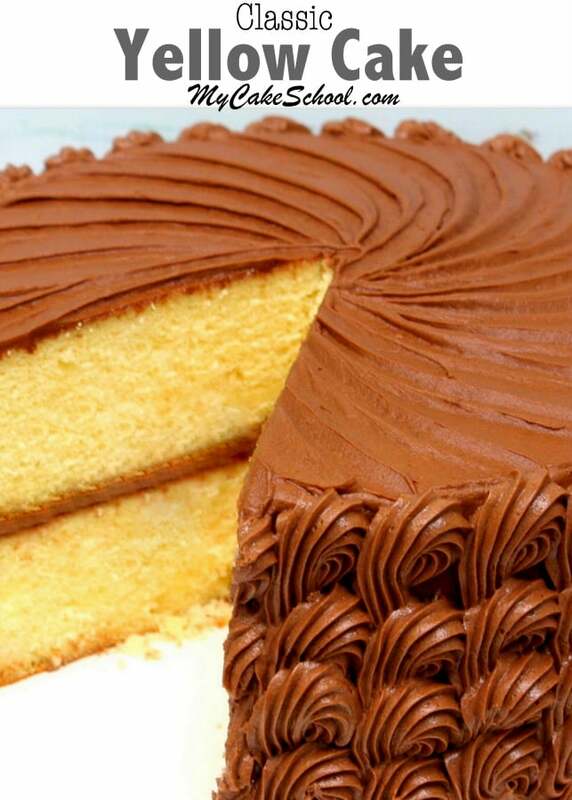 Homemade yellow cake with chocolate buttercream is such a classic combination! 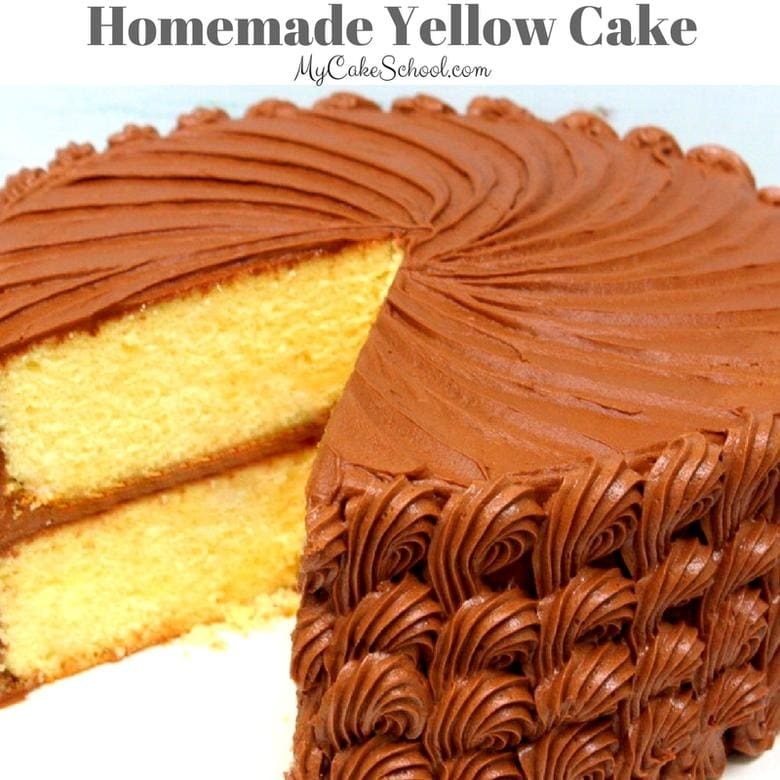 I loved scratch yellow cake with chocolate frosting growing up, and still do. We’ve shared our FAVORITE classic chocolate buttercream recipe below. Like several of our scratch cake recipes from our Recipes Section, this yellow cake recipe uses the reverse creaming method of mixing. If you are unfamiliar with this mixing method, the ingredients are added in a different order than you may be used to. We hope that you enjoy this moist and delicious scratch yellow cake as much as we have! *Special thanks to my Aunt Kay for sharing her mother’s recipe with us that we have all fallen in love with over the years! Preheat oven to 350 degrees. Grease and flour two 8 inch pans. In a bowl, combine eggs, milk, flavorings (if making a coconut cake, add an additional teaspoon of coconut), and vegetable oil. In the bowl of your mixer, combine flour, sugar, salt, and baking powder. Whisk the dry ingredients for 30 seconds to combine. With your mixer on low to medium speed, slowly add the pieces of butter, a few pieces at a time. Beat until the dry ingredients are moistened by the butter and look like crumbly coarse sand. Scrape the sides and bottom of the bowl to make sure there is no dry flour. SLOWLY with the mixer on low speed add approximately 1/2 of the egg mixture to the dry ingredients increasing to medium speed for 1 1/2 minutes, the batter will be thick and fluffy. Scrape the bowl and add the remaining egg mixture in 2 pourings, scraping the bowl and beating for 20 seconds after each addition. Bake at 350 degrees for 30 - 35 minutes or until a toothpick inserted in the center comes out clean. Let the cake cool in the pans 10 minutes then turn out. 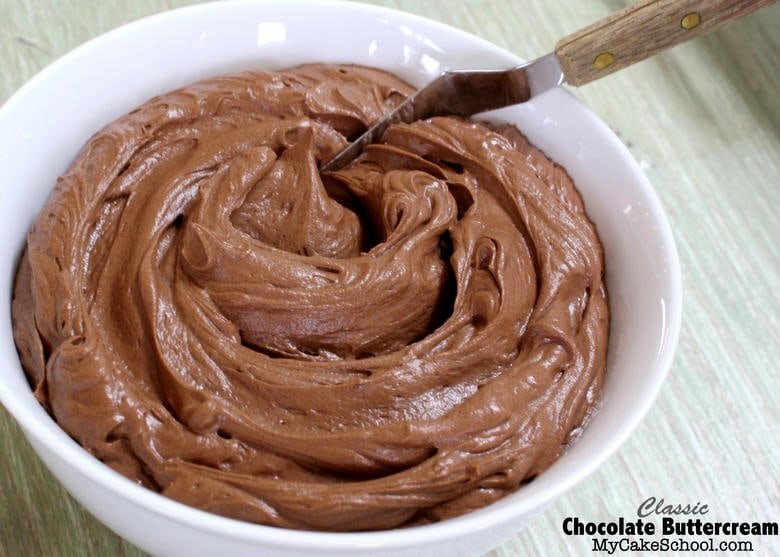 As mentioned above, we are also sharing our FAVORITE Classic Chocolate Buttercream Frosting Recipe! Don’t even think about canned chocolate frosting. I promise, this creamy chocolate buttercream tastes a million times better and is SO easy to make! We love to use this homemade yellow cake recipe as a base of our marble cake. When you can’t decide if you’d rather have yellow cake or chocolate cake, marble cake is the answer! 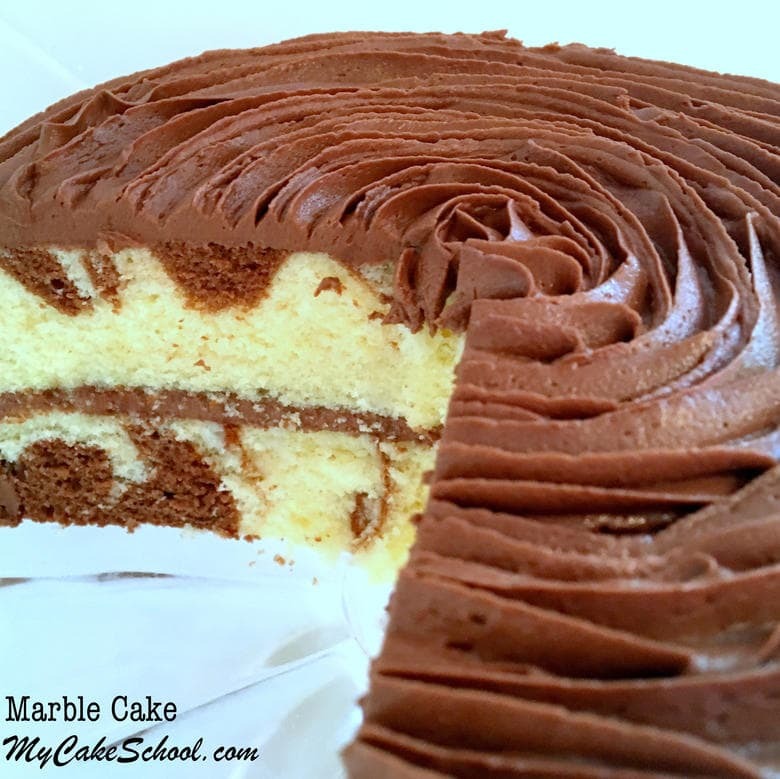 Find the deliciousness here: Marble Cake Recipe! Don’t miss our full collection of favorite cake, filling, and frosting recipes in our Recipes Section, and tons of free step by step cake and video tutorials in our Free Cake Tutorials section! Finally, if you would like to become a member of MyCakeSchool.com, we would love to have you!! Members have access to our entire cake video tutorial library, which includes hundreds of cake video tutorials! No matter what your cake decorating skill level, there is always something exciting and new to learn! You can find all of the information here: Join MyCakeSchool.com! How tall of a cake does this make? Hi Stephanie, We did not make a note on that but I would say each layer is 1 1/2 to 1 3/4 inches tall. With filling and frosting it should be close to 4 inches tall. In your yellow cake recipe, is it regular milk or buttermilk? Hi Rena, It is regular milk, we used whole milk not reduced fat milk. can I use 9in pan? Do I have to double or add another 1/2 of the recipe for 9 in pan? Hi Jim, You could make 1 1/2 times the recipe and bake in two 9 inch pans. Below are links to 2 batter amounts charts that you will find helpful. Could I substitute buttermilk for the regular milk without making any other adjustments to the recipe? I find that I prefer buttermilk to milk in most homemade recipes. Any reason regular milk is preferred here? Thanks! Can I use a hand held mixer? I’m wondering… I measured 2.5 cups out and transferred to a bowl with a snake that said 385g. Is my measuring off or should it be 385 instead of 285? Hi Emily, The gram weight is correct as written at 285grams for 2 1/2 cups cake flour. Did you remember click on the Tare button on your scale to zero out the weight of the bowl you were measuring in? Also, when measuring flour we spoon the flour into a measuring cup and level off with the back of a knife. If you dip your measuring cup into the flour container to fill your cup, you will be packing more flour into the measuring cup than you should. These are possible causes of your weight being incorrect. Hope this helps. 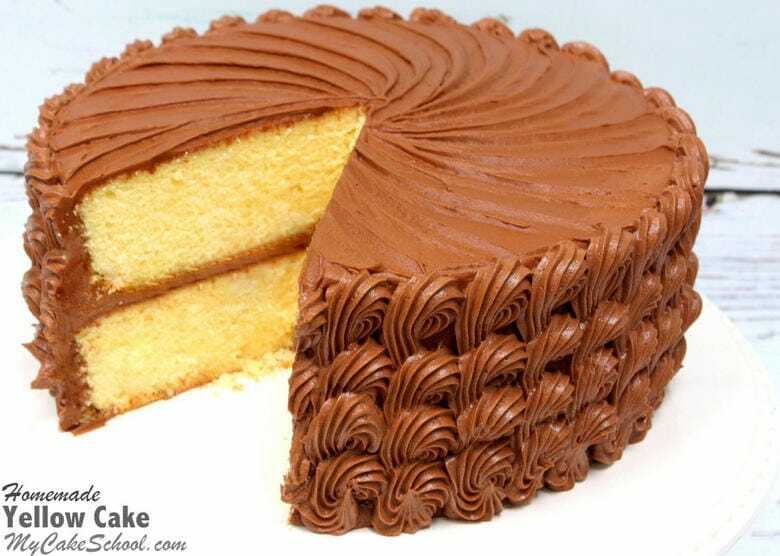 Perfect cake.. I loved baking it..
Hi, does the eggs need to be room temperature? Hi Pinky, Thank you for your nice comment, I’m happy you enjoyed the cake. Hi Shelly, We let the eggs warm up a bit before mixing. If they are cold from the refrigerator, you can put them in a bowl of very warm water for 5 minutes. Hi Pinky, We have never made a Mud Cake. We do have a Simple Spreadable Ganache recipe in the recipe section. It can also be whipped for a whipped ganache. What is cake flour and can you use regular flour? For each cup of flour in the recipe, remove 2 Tablespoons flour (return it to your flour container) replace that flour with 2 Tablespoons cornstarch. This recipe uses 2 1/2 cup flour. Measure out 2 1/2 cups all purpose flour, remove 5 Tablespoons and replace with 5 Tablespoons cornstarch, whisk to blend and proceed with the recipe.